Background: Some studies have suggested using epidural analgesia after cancer surgery to reduce metastasis. This article examines the relationship between regional anesthesia (RA) and cancer metastasis in an array of cancers. Methods: We conducted a review of the literature using PubMed and included 67,577 patients across 28 studies in a metaanalysis, evaluating the hazard ratios (HRs) of overall survival, recurrence-free survival, and biochemical recurrence-free survival. Results: We found no benefit to RA as it relates to cancer. The HR was 0.92 for overall survival, 1.06 for recurrence-free survival, and 1.05 for biochemical recurrence-free survival. Despite the overall analysis showing no benefit, we found some benefit when we evaluated only the randomized trials. However, we found no significant benefit of RA when we evaluated the cancers (gastrointestinal, prostate, breast, and ovarian) individually. Conclusion: This metaanalysis shows that RA has no overall survival, recurrence-free survival, or biochemical recurrence-free survival benefit. However, some individual studies have shown significant benefit in terms of cancer recurrence. Further, RA reduces the use of opioids, which has led to some secondary benefits. Further studies are needed to establish the benefits of RA as it relates to cancer. Several theories explain how cellular proliferation and growth occur, but one that is often cited is “seed and soil.”18 Tumor nutrition is initially met with diffusion, but with time, angiogenic factors are secreted, allowing neovascularization to occur. Neovascularization often occurs in response to injury and inflammation. An evolving tumor cannot progress beyond a 2-mm diameter size without angiogenesis occurring to meet its increasing metabolic requirements.17 The mediators of this process include vascular endothelial growth factor (VEGF), matrix metalloproteinases (MMPs), tumor necrosis factor-α (TNF-α), transforming growth factor-β (TGF-β), and prostaglandin E2 (PGE2).18 VEGF stimulates signaling pathways that lead to proliferation and migration of endothelial cells, increase vascular permeability, and—if tumor cells express tyrosine kinase VEGF receptors—lead to de-differentiation and tumor spread in an autocrine manner.18,19 MMPs lead to degradation and remodeling of the extracellular matrix.18,20 PGE2 is important in phagocyte-mediated immunity and in limiting the potential harmful activation of cytotoxic cells.18 PGE2 has been shown to play an important role in cancer by inhibiting apoptosis, stimulating angiogenesis, enhancing invasion,18 and enhancing migration and invasion via activation of the epidermal growth factor receptor (EGFR).21 Of note, mutations of EGFR have been linked to several cancers.21 In the postoperative period, PGE2, which is also produced by tissue injury and postoperative wound healing, may mediate metastatic progression.22 The cytokines TNF-α and TGF-β are involved in systemic inflammation and function in the regulation of immune cells. When the inflammation cascade is activated, cancer cells spread by entering the lymphatic system and, finally, the general circulation. In an attempt to identify the areas in which RA may have a proven benefit on cancer progression, we performed a metaanalysis. 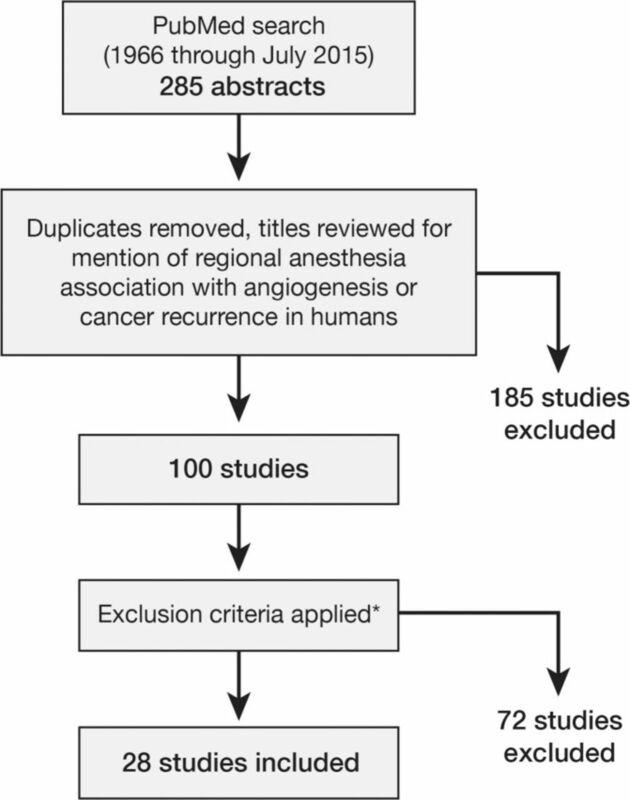 We reviewed the literature, searching PubMed for “regional anesthesia and cancer angiogenesis” and “regional anesthesia and cancer recurrence.” After duplicates were removed, the search yielded 285 abstracts for initial review, 100 of which discussed RA association with angiogenesis or cancer recurrence in humans. We excluded reviews, metaanalyses, editorials, opinion pieces, and articles that exclusively discussed intraoperative analgesia, did not provide a comparison between GA and RA, were written in languages other than English, or were unavailable as complete articles. If our author team knew of pertinent literature that did not include specific details for inclusion in the review, the corresponding authors were contacted for additional information. We also reviewed the references from the included articles to ensure no article had been overlooked. The primary factor for inclusion in this metaanalysis was a comparison between RA and GA. Twenty-eight articles met this inclusion criterion. Figure 1 illustrates the literature search methodology. The primary outcomes were overall survival, recurrence-free survival, and biochemical recurrence-free survival compared via hazard ratios (HRs). Literature search methodology. *Reviews, metaanalyses, editorials, opinion pieces, articles that exclusively discussed intraoperative analgesia, articles that did not compare general anesthesia and regional anesthesia, non–English language articles, and papers that were not available as complete articles were excluded. HR is a measure of how often a particular event happens in one group (treatment group) compared to how often it occurs in the control group. HR provides opportunities for articles to be evaluated in a uniform fashion. Weighted HRs were obtained by averaging the HRs from each of the individual articles. The ratios were weighted to highlight the effects of sample size in the analysis. Some of the observational studies were large and had the potential to skew the analysis significantly. An HR >1 denotes increased risk, an HR <1 denotes decreased risk, and an HR equal to 1 denotes no change in risk. 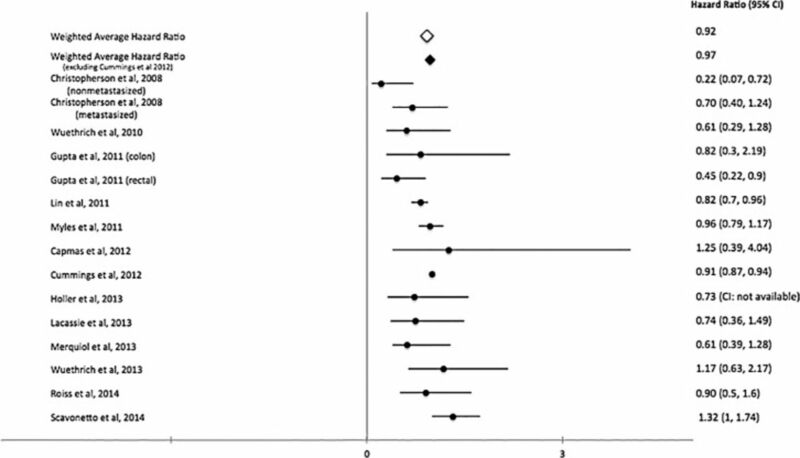 Both observational studies and randomized controlled trials (RCTs) were evaluated. Results from both observational studies and RCTs were analyzed individually and together to provide a comprehensive analysis. Further, some of the studies provided both recurrence-free intervals and mortality rates that were analyzed individually because they evaluated different metrics. Survival outcomes in patients with prostate cancer are not clear because many patients live for extended periods after diagnosis. As a result, many studies involving prostate cancer use biochemical recurrence as the endpoint, and those that use overall survival should use dual study arms to compare outcomes accurately. Biochemical recurrence is defined as either an increase of prostate antigen from its postoperative nadir or >0.2 ng/mL.73 Biochemical recurrence is not a perfect endpoint because it does not translate into cancer-specific survival.94 In addition, many studies focus on cancers in the advanced stages to help discern the survival benefit. No randomized trials are available, and the identified studies are mostly observational and retrospective. This study has multiple limitations, the most important being that many of the studies included are retrospective. While some of these studies used several factors to match patients in the study arms, some factors may still be unaccounted for. In studies that evaluate cancers in advanced stages, the mortality rate is high at baseline. Consequently, defining overall survival and measuring recurrence-free survival or biochemical recurrence-free survival in these populations can be difficult. Patients with advanced-stage cancer have a high likelihood of dying from diseases that are secondary to the cancer but not directly attributable to the cancer, limiting the ability to calculate survival benefits. In studies that use recurrence as the primary outcome, different criteria are often used to define recurrence. Many types of recurrence exist, and comparing the different types can be challenging. Some types of recurrence are not associated with overall survival, diminishing its prognostic value. Further, many studies evaluate patients during a period of time that is too short to reach significant conclusions. Numerous studies lacked significant power to draw strong conclusions. Some studies included in this analysis were performed on particular populations, so translating some of these findings to the general population may be challenging. Finally, in some studies, patients received multimodal analgesia, which made evaluating the analgesia techniques individually especially challenging. RA has been shown to have no overall benefit in overall survival, recurrence-free survival, and biochemical recurrence-free survival. However, numerous individual studies have shown some benefit, and results have been controversial. Different mechanisms have been proposed to explain this benefit but none has been proven. Thus, more work is needed to critically evaluate the role of RA in a prospective, randomized fashion. Clinical trials are underway across the world to evaluate the impact of RA. RA has the potential to alter the way cancer pain is managed and could significantly impact morbidity and mortality. Effect of anaesthetic technique on the natural killer cell anti-tumour activity of serum from women undergoing breast cancer surgery: a pilot study. Br J Anaesth. 2014 7; 113 Suppl 1:i56-i62. doi: 10.1093/bja/aeu200. ANZCA Trials Group Investigators. Perioperative epidural analgesia for major abdominal surgery for cancer and recurrence-free survival: randomised trial. BMJ. 2011 Mar 29;342:d1491. doi: 10.1136/bmj.d1491. 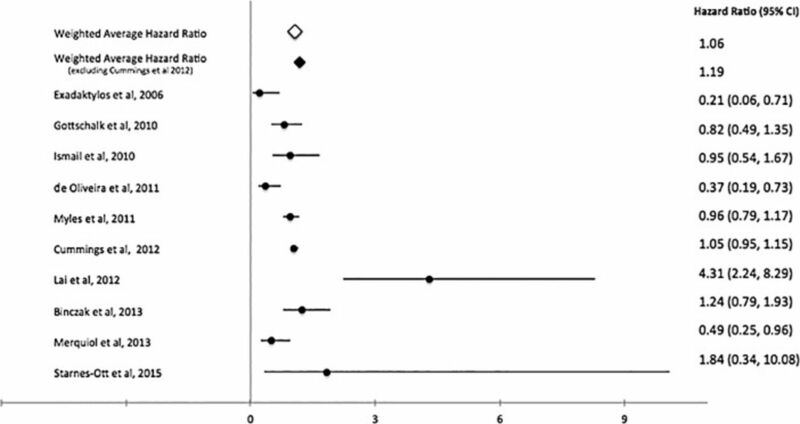 Association between neuraxial analgesia, cancer progression, and mortality after radical prostatectomy: a large, retrospective matched cohort study. Br J Anaesth. 2014 7; 113 Suppl 1:i95-i102. doi: 10.1093/bja/aet467.